Tropical rainforests have long captivated the curiosity and admiration of mankind. From towering trees to dense forest floors, rainforests are rich in natural beauty and biodiversity unrivaled by few ecosystems on Earth. But beyond the outer reach of our rainforests, another ecosystem thrives in a vastly different yet similar world. Maui Ocean Center’s Shallow Reef Exhibit. Beneath the ocean’s waves, coral reefs reign as ancient, complex, and living ecosystems that are often called the rainforests of the sea. 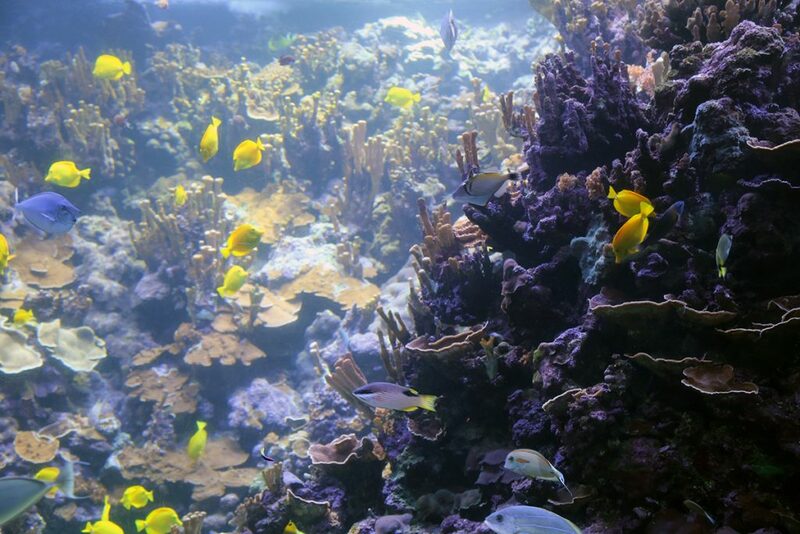 Like tropical rainforests, coral reefs provide life and habitats for an array of plants and animals. The underwater seascape may lack flocks of exotic birds and vine-covered trees, but one’s imagination can see their aquatic equivalents: schools of colorful reef fish, coral colonies with parrotfish grazing on algae, bird wrasses fluttering their pectoral fins, butterflyfishes darting above the reef, and eels slithering in and out of sight. 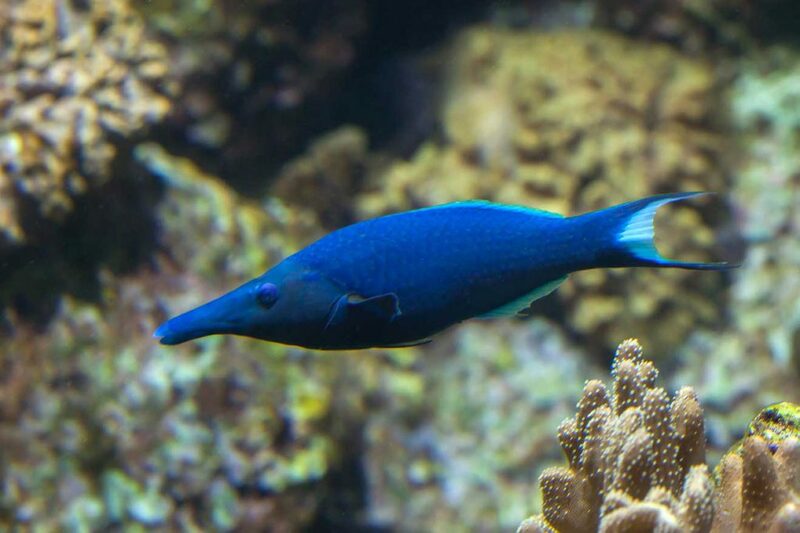 The bird wrasse is named for its bird-like beak. Coral reefs are believed to be the world’s most biodiverse ecosystem, even more so than tropical rainforests, but both are cornerstones to our planet’s health. Approximately 6% of the world’s land surface is covered by rainforests with more than 50% of plant, animal, and insect species living within these ecosystems. In comparison, less than 1% of the world’s marine environment is occupied by coral reefs, yet these ecosystems provide homes to over 25% of known marine species. Coral reefs are also home to 32 of 34 recognized animal Phyla whereas only 9 are found in tropical rainforests. 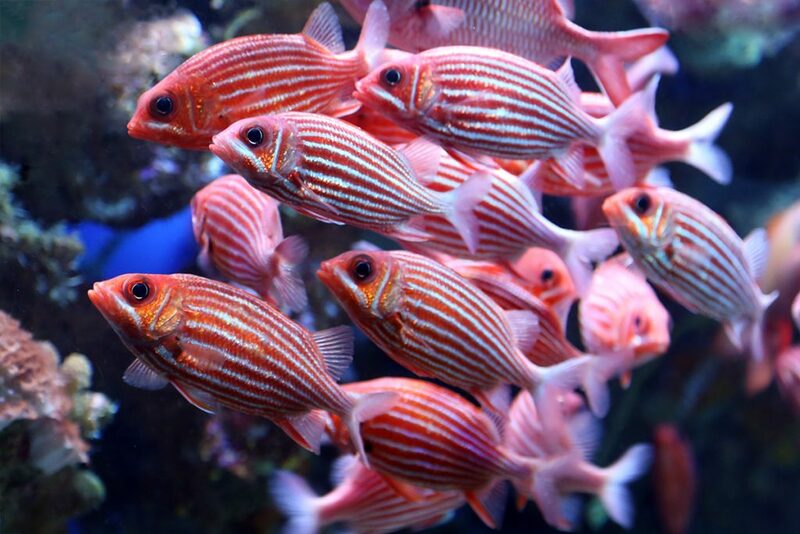 A school of brightly colored Hawaiian squirrelfish (‘ala‘ihi) are one of many fish species that are endemic to Hawaii. Of all coral reef ecosystems, Hawaii’s reefs stand out as one of the most unique and endemic on Earth. The Hawaiian Islands’ geographical isolation has resulted in high levels of endemism, the occurrence of unique species to a particular region. Over 25% of all marine species are endemic to Hawaii and found nowhere else in the world. According to the National Oceanic and Atmospheric Administration’s study of Hawaii’s deep-sea coral reefs, 43% of the documented fish species were endemic, far greater than the 17% of endemic fish species in Hawaii’s shallow water reefs. At the northern end of the Papahanaumokuakea Marine National Monument, the level of endemism is close to 100% which is the highest level recorded from any marine ecosystem to date. One could argue that Hawaii is the world’s capital of endemism. Despite a high level of endemism, Hawaii’s coral reefs are low in biodiversity compared to the Indo-Pacific region. Hawaii’s number of inshore fish species is estimated to be 680, considerably less than the 1,400 in Micronesia and 2,000 in the Philippines. Comparing the number of hard coral species, approximately 66 species inhabit Hawaiian waters while the Philippines, Indonesia, and New Guinea waters have over 500 species. 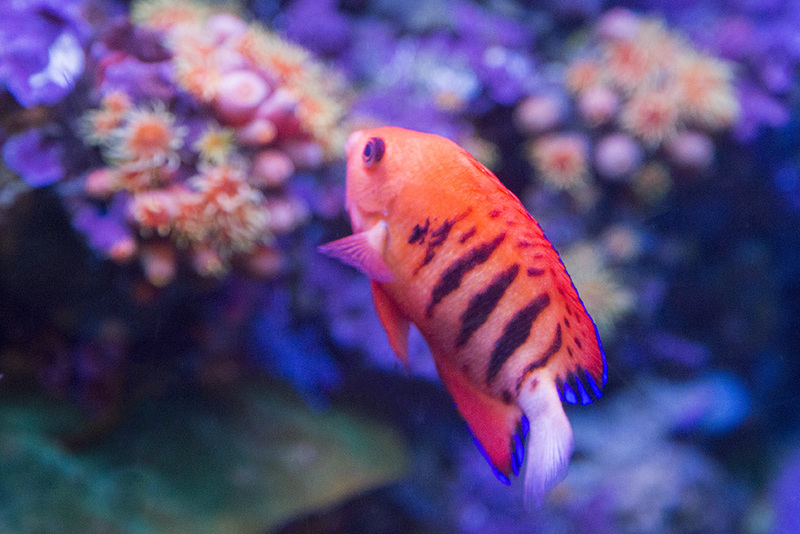 The vibrant flame angelfish found in Hawaii is common throughout the Tropical Pacific. Maui’s crystal blue waters are home to several world-renowned coral reefs. Olowalu’s 1,000-acre reef is the “crown jewel” of Maui, a hub for marine life, and home to the Main Hawaiian Islands’ oldest coral. In 2017, it was designated as Hawaii’s first Hope Spot by the Mission Blue Sylvia Earle Alliance as a place deemed critical to the health of the oceans. Molokini Crater, Ahihi Kinau Natural Area Reserve, and Honolua Bay are just a few of Maui’s most popular snorkel and dive sites. Hawaii’s coral reefs are a remarkable place to explore and become entranced by one of nature’s most awe-inspiring environments. They live up to the title of rainforests of the sea for their richness in life and mystique. While visiting these places, please use proper reef etiquette and be conscious of ocean conditions, or visit us at Maui Ocean Center, The Aquarium of Hawaii to encounter marine life and live corals throughout our Living Reef exhibits.